Josh Topal is our product marketing manager for SecuriSync. 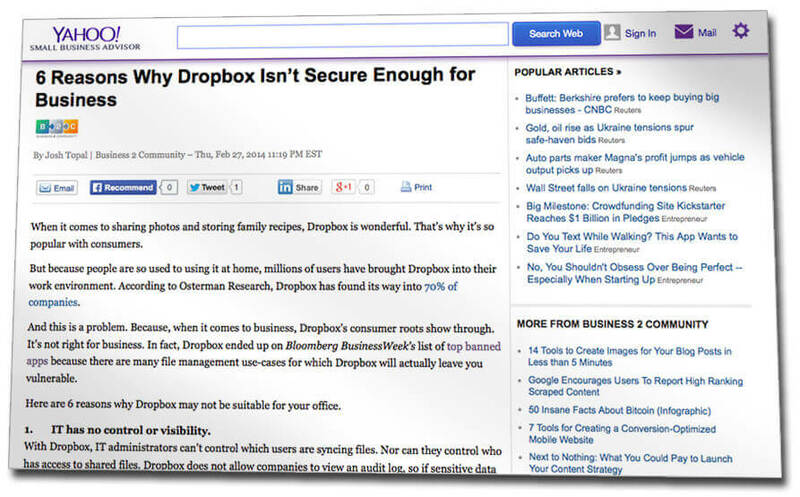 He was recently asked by the website Business 2 Community to write about a subject near and dear to his heart: how, when it comes to security for business users, Dropbox falls short. Not only has his article gotten a lot of response, it was even picked up for syndication by Yahoo. IT has no control or visibility. Users can’t set granular permissions. You can’t set different sharing permissions for sub-folders. You can’t share password-protected web links. You can’t lock files for collaborative editing. Give it a read on Business 2 Community or on Yahoo.